A system of government in which the rights of citizens are protected by a constitution and the populace elects officials to establish laws and a head leader to run the state; or, a nation run by such a government. Throughout history, the idea of a republic has held appeal for many societies. From ancient Rome to the United States of America, and indeed to the galactic commonwealth in Star Wars, republics have been valued as a system of government for their ability to represent the wants and needs of communities and to protect the liberties of private citizens. A government is referred to as a republic if it is run by officials chosen by democratic election. In such an administration, periodic elections are held in which civilians have an equal vote in deciding who will run the state. In this way, power is meant to rest in the hands of the people, ensuring that no one's rights are infringed upon, that the needs of the many (or at least of the majority) are met, and that no authority becomes dictatorial. To further protect the people from tyranny, a republic is guided by a central charter or constitution which lays out and makes immutable the fundamental liberties of its citizens. This type of government is usually much more attractive to ordinary civilians than, say, a monarchy or despotism, in which absolute power belongs to a central governing figure – a situation which often breeds corruption. Usually, a republic is headed by a single official, such as a president, or a small group, such as a congress, and includes a legislative body which establishes laws. This system also often includes a judicial branch that is responsible for interpreting laws and maintaining order, as is the case in the United States. Besides referring to this type of democratic government, the term republic can also be used to describe a nation that is led by such an administration. In the nonpolitical realm, republic is sometimes used to refer to an official organization of like-minded individuals. These individuals are understood to have equal voices within their organization, and they sometimes hold elections to determine who will make decisions and run the group's everyday affairs. Such a republic is usually formed of people working together to accomplish a specific purpose or serve certain duties. For example, a group of people determined to bring readers closer to vocabulary words might form a republic of lexicographers. Example: Before becoming a part of the United States, California spent a few weeks as an independent republic after a group of American citizens rebelled against the Mexican government. Example: A local group of historians formed a republic with the intent of appreciating and preserving town landmarks. One of the most common derivatives of republic is republican, a noun used to describe someone who advocates for the aforementioned form of government. Many political systems also include officials known as Republicans (note the capitalization) who are sometimes part of Republican parties; however, the specific implications of such labels vary among different nations. Sometimes, republican is used as an adjective to describe something as being characteristic of a democratic, representative form of government. In turn, the word republican has given rise to its own set of derivatives. Republicanism is a political school of thought which can focus on the formation and activity of either a republic or a Republican party. By the same token, republicanize is a verb which refers to the action of shaping something in the form of a republic. The basis of republic lies in the Latin roots res, which means "affair," "situation," "event," or "thing," and publica, a cognate of "public." This combination was used in Latin to indicate formal political matters which were handled by public decision. The word was adopted in Middle French in the fifteenth century as république, a term that referred to a government in which power resided in the hands of the populace. Republic took its place in English in the early 1600s as a word to describe a government in which civilians were represented by elected officials. I put great illusion in the Republic. I believe firmly in the Republic and I have faith. I believe in it with fervor as those who have religious faith believe in mysteries. Here, the character Pilar is expressing her devotion to a fair representative government, even going so far as to compare her passion to religious faith. While for most of us, i.e. non-students of Political Science, a democracy and a republic might seem like the same thing, there is actually an important distinction between them. Although the United States is often casually referred to as a democracy (and indeed it does make use of many democratic principles), this labeling is specious. The United States and most modern nations with representative governments are in fact republics. The main difference between the two lies in the fact that, in a republic, all people possess certain rights outlined by a defining constitution. These rights are considered inalienable, meaning that they cannot be taken away by any vote or law. This ensures that the basic rights of individuals – for example, freedoms of speech and press – can never be overridden. In a true democracy, which lacks such a constitution, the rights of individuals are not so secure. A true democracy is run directly by the will of the majority, and it does not possess checks to prevent an abuse of power. 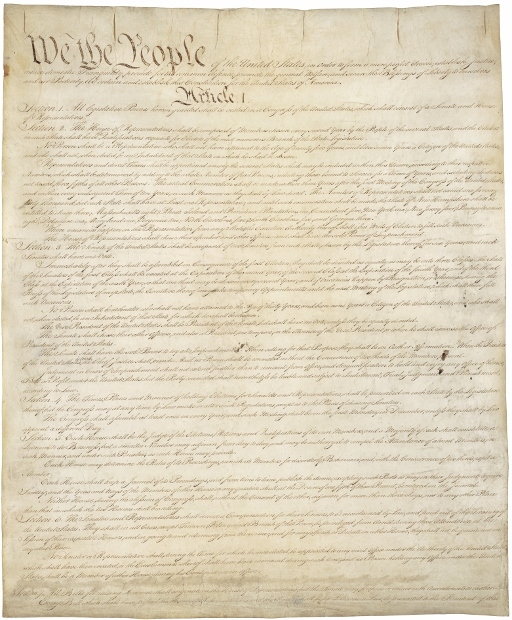 This means that the rights of any individual or group can be infringed upon if the majority wishes - a situation that unfortunately holds the potential for "mob rule" and discrimination. For example, in a true democracy, if one specific group – political, religious, etcetera – gains enough numbers to constitute a majority, they can use their influence to control the outcomes of elections. That one group could then forge policies according to their own interests and potentially limit the liberties of minorities. In fact, the Founding Fathers of America were very aware of this danger, and they made a point of structuring the United States government in such a way as to protect the basic liberties of citizens in all circumstances. A republic represents the public.